Hey, you can’t bring a sword to a wrestling match! Listen Japan, I keep trying to tell you: if you don’t want robots overthrowing your civilization you need to stop breeding them for gladiatorial combat. The 16th Robo-One Championship was held recently in Toyama City, Japan. Started in 2002, this biannual event has a great demonstration competition but its the combat that really gets the fans cheering. Bots wrestle, push, and flip to knock their opponents off balance or out of the ring. Why do we force these mechanical minions into melee matches? Because it’s awesome. Check out the slew of videos after the break. Thanks to Wired Magazine for collecting them in one place. Much like Kondo Battle, or RoboGames, Robo-One Championship is as much about having fun as it is about winning. As such, many of the competitors don’t really stand a chance in the ring, they’re there to demonstrate new techniques in engineering, or to just show off some really cool designs. This 16th Robo-One event had several noteworthy bots including a Transformer, a Gundam, a xylophone player, and a robot that could shoot a bow and arrow. While these robots won’t change the world, they do demonstrate the creativity and enthusiasm that robotics provides at all levels of amateur and professional skill. 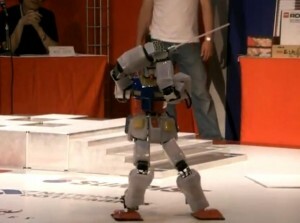 The meter tall, 25 kg, transformer robot was built by Takeshi Maeda and is named Omni Zero 9. It can autonomously climb stairs, roll up a ramp, and even let you ride if you’re brave enough. I really can’t believe what I’m seeing at 1:14. That’s weird and awesome. Omni Zero 9 isn’t a slouch in the ring either, check out how it dominates the competition in the second video. For those of you who like your robots with a little more flair, I present to you Automo Wakka, the robot built to look like a Gundam (from the anime). While I’m not so impressed with the way it walks across rocks, it can certainly handle a sword and obviously had some enthusiastic operators. Do the hands look like they might be the Melissa Model from Kondo? Automo Wakka did pretty well in the wrestling matches. It out shoved the flipping robot in the second video. As always, Robo-One had displays of non-combative talent. The bow and arrow bot could fire a suction cup onto a plate of glass with a minimum of help. And while I didn’t recognize the tune, I was impressed with the xylophone robot‘s ability to play and sing at the same time. 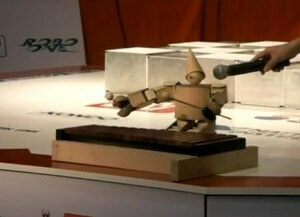 Let’s hope that the future of robotics is more closely related to these performances that the competitions in the ring. Let it go on record that I have never forced a robot to fight another robot. As lame as that statement may make me now, hopefully it will keep me safe when the robots come to power. Don’t say I didn’t warn you. Panes of glass beware, robotically fired suctions cups are coming! I didn’t catch the tune, but it was still a good performance.